Walking into the studio with Caroline Ritchie, I feel like I’m entering a sacred place. To Caroline it is sacred, for her art is inseparable from her faith. Taped on the wall of her workspace are Bible verses and a small picture of Caravaggio’s Paul’s Conversion on the Road to Damascus—reminders to her of the spiritual purpose behind what she creates. Laying out on the paint-splattered floor and leaning against the wall is her work of the past year: paintings and drawings based on photographs that belonged to her grandmother. There is a portrait on a nearby easel that shows a dark-eyed woman with her hair in big 1940s curls. “She passed away the day after my mom was born so I never knew her,” Caroline explains. The painting is entitled Revealed Revelation and was a way for her to learn about the grandmother she never met and reveal a memory that might otherwise have been lost. The other artwork that crowds the space looks like poster-sized vintage snapshots of people from the past. “I’m just bringing their story—which is still important to the Lord—back to life,” Caroline says. For her, making art from her grandmother’s photographs is just another way to incorporate faith into her work by showing how God can speak through the lives of those who have lived before her. She also talks about how one of her English ancestors was a jester for King George, but that’s another story. Family is an important part of Caroline’s art and life. Growing up in a suburb of Atlanta, she found, and continues to find, inspiration as an artist from her older brother who also likes to draw. Her whole family is supportive of her passion for drawing and painting, reminding her not to give up. But she doesn’t just get support from her biological family, she also gets encouragement from fellow art students—a group she considers a sort of family to her—with whom she feels a strong sense of “comradery.” It has been a vital part of Caroline’s creative journey to be surrounded by those who encourage her not to listen to the naysayers who doubt the value of a career in art. “My grandmother came from a family of fourteen,” Caroline says, explaining the large group of people in a drawing called A Moment from Yesterday. Caroline uses a variety of means to replicate the effects of time in her work. To make the pieces look more like the sepia photographs on which they are based, she soaks the paper in coffee and tea. With others, she paints on different fabrics to incorporate the idea of people being woven into a family line while still being unique. 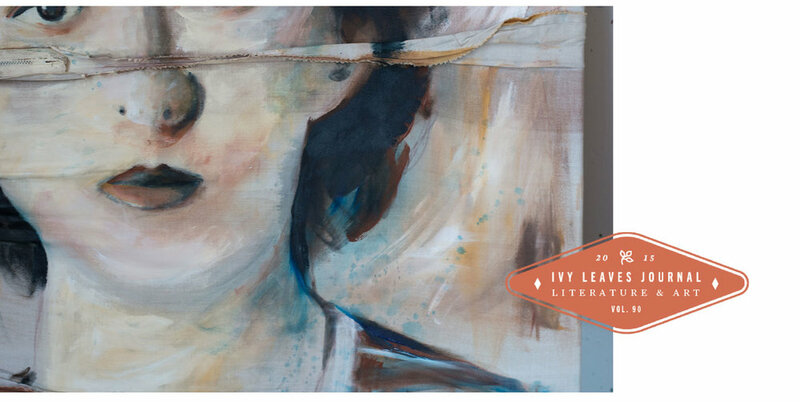 Her grandmother’s portrait is painted on an old dress and a zipper runs across the canvas. Some of the pieces also incorporate the idea of the present meeting the past; she puts these drawings in a plexi-glass “skeleton” frame to imply how one’s mind encases a memory or story. From an early age, Caroline’s heart was drawn to what she could create with a pencil. “I used to try to be a fashion illustrator and have my own company called Caroline’s Designs,” she says, laughing. Still, she knew early on, even as a child, that she wanted to do something with painting and drawing as a career. When others challenge her with the question ,“What can you do with art?” she tells them that “God’s gifted me this way.” It is this quiet confidence in God’s purpose for her art that makes her open to many possibilities after Anderson University, including graduate school or teaching. Her “ultimate passion,” though, “is to incorporate ministry with art.” For Caroline, artistic creation always comes back to the fact that through her art she can help and encourage others. “Art,” she says, “is a way that you can minister to people, a vessel to speak through, a way to communicate without words.” Through her art, Caroline is telling a story. She is revealing the story of her family and their spiritual history. A story of love, grief, and joy—one that will speak to those who see her work in a deeply timeless way.